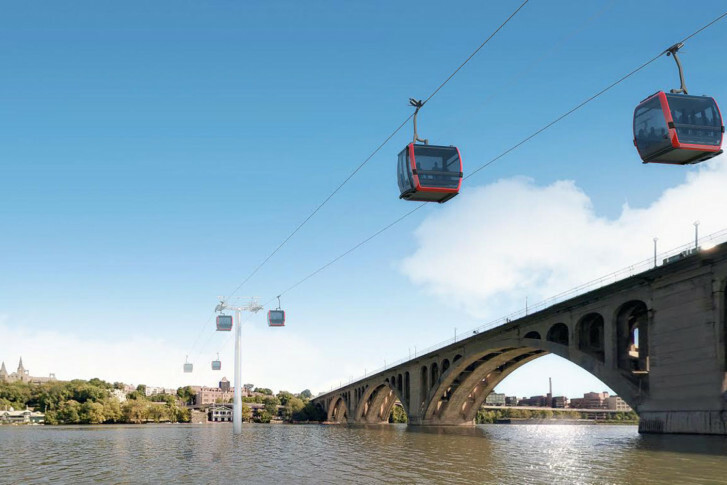 Development planners in Arlington and D.C. have an idea to use gondola cars on high wires to combat the traffic congestion on the Key Bridge, and a study is underway to see whether the plan could work. WASHINGTON — Overhead gondolas are probably best known for their use at ski resorts, but many cities are turning to them as another mode of transportation for residents. Development planners in Arlington and D.C. have an idea to use cars on high wires to combat the traffic congestion on the Key Bridge, and a study is underway to see whether the plan could work. “It’s a very innovative technology and it is definitely something that we thought was interesting enough for our communities to explore,” said Mary-Claire Burick, with the Rosslyn Business Improvement District. With contributions from the public and private sector, an architecture firm has been hired to decide on the feasibility of the idea. Otto Condon, with ZGF Architecture, is leading the study and said part of the task is proving the systems isn’t going to be just a toy for tourists. “That’s going to be our charge — to prove that it can be transit and it can be a great experience,” Condon said. Initial renderings have the cars running from the Rosslyn Metro station along the Key Bridge to a yet-to-be-determined point in Georgetown. The size of the cars also hasn’t been determined. Gondolas can hold eight to 12 passengers, whereas the bigger aerial tram cars can hold 50 to 200 passengers. “Georgetown is the largest employment center in the District of Columbia that doesn’t have a Metro station, so this would essentially be Georgetown’s Metro station for the foreseeable future,” said Joe Sternlieb, with the Georgetown Business Improvement District. Sternlieb said the initial discussion calls for cars coming through the stations continuously, every 10 to 12 seconds. Big questions still need to be answered, including how much it would cost to build and sustain it, and who will pay for and operate the system. Also, the study aims to determine whether it will be an effective mode of transportation which can support economic development. Finally, at least 13 local and federal agencies must sign off on it, so the study needs to figure out whether the system can be approved. Condon says his team will also examine how the project can be built to complement the architecture in the area. “Part of the study will be the visual aesthetics of what the station may look like, what the whole system may look like,” Condon said. An additional sticking point could also be with D.C.’s L’Enfant Plan, which forbids high wires in the District, Condon added. At the Spectrum Theater, in Rosslyn, residents gathered Thursday night to hear from the firm conducting the study and to learn about and weigh in on the system. “My basic interest here is to free my wife from that deepest inner circle from hell, which is the Georgetown Hospital parking garage,” said Dave Schutz, of Arlington, Virginia. Omar Nasery, from Falls Church, Virginia, said he believes taking Gondola could be an option for his frequent trips between Georgetown and Virginia — depending on the cost. “In my mind I’m seeing this more as an entertainment and tourist attraction, and this is being put in a high-density area with no parking availability,” said Nicole Merlene, of Rosslyn, Virginia. The plan remains in the very early stages and this initial study is expected to finish this fall.